This covetable cookbook is a greatest-hits collection from Sugar Cube, a tiny pink food cart in Portland, Oregon, that is thronged daily by hungry hordes craving voluptuous sweets intensified with a spike of booze, a lick of sea salt, or a "whoop" of whipped cream. Sugar Cube founder and baker Kir Jensen left the fine-dining pastry track to sell her handmade treats on the street. Recipes for 50 of Kir's most enticing cupcakes, cookies, tarts, muffins, sips, and candies are made more irresistible (if possible!) by 32 delicious color photographs. Sassy headnotes and illustrations that resemble vintage tattoos liven up this singular boutique baking book. 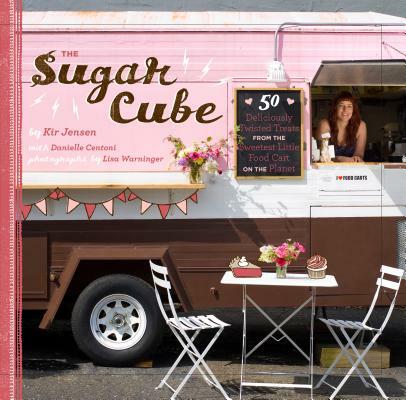 Kir Jensen is the owner and chef of the Sugar Cube food truck. She lives in Portland, Oregon. Danielle Centoni is editor of Mix and a food writer whose work has appeared regularly in the Oregonian. She is the co-author of Mother's Best: Comfort Food that Takes You Home Again. She lives in Portland, Oregon. Lisa Warninger is a lifestyle, fashion, and food photographer based in Portland, Oregon.